Grateful Blog: Day 92: I was Cub Scout when I was little. Mom was our Den Mother. And then I was in Webelos, followed by Boy Scouts. It was 30 years ago. Both of my older brothers were Boy Scouts so naturally I was expected to join too. It was really one of the most funs things we did as kids. 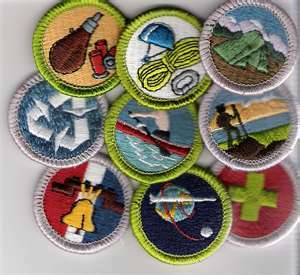 Sure there were meetings and merit badges and award ‘banquets’ but all of those activities were virtual excuses for us to get together with a different circle of friends (different than school and sports) and run around like banshees. I’m sure our parents liked the down time too. My Dad helped a lot as a leader. He drove us places, took us camping, helped us make our Pinewood Derby Race Cars (well OK, he made them and we watched but consequently they actually ran well) and got dragged along on a number of rainy hiking or canoeing trips. When my Dad was a kid he joined the Boy Scouts too. But I guess when he got home with his tan uniform on his Dad made him immediately take it off and take it back, and quit the troop. His father had fled Germanyin 1933 and had seen the Hitler Youth and Brown Shirt movements and apparently the Boy Scouts was too close of a reminder. I don’t know much about either, but I suspect it couldn’t have been farther from the truth. I made it all the way to Eagle Scout. Of course by then I was 17 and I was ready to move on. I was headed into high school and Boy Scouts wasn’t ‘cool’ any longer. But the truth is it was ALWAYS cool. It seemed like about every other weekend we were doing something fun: Usually some from of hiking, backpacking, camping, that sort of thing. Sure we did things that sounded like work, fundraisers, paper drives, etc. but our friends were there and we made it fun. Our adult leaders, Mr. Carges, Mr. Staub, Mr. Sullivan and my Dad in retrospect were some of the coolest guys you’d want to have around. They read you the riot act when you deserved it, but they showed you a few tricks too. And unlike what you read about Boy Scouts leaders in the newspaper, there was never any hint of that. Just our friend’s Dad’s showing us the ropes—and the knots for that matter. The Scout’s motto is ‘Be Prepared’ and its funny how we it prepared us for later on in life. Maybe the best part of being a part of Troop #233 was heading to summer camp every year. Swimming, sailing (more like tipping the sailboats over), campfires, hiking, rafting, day trips into places like Lake Placid to see where they had the Olympics, and singing in the mess hall (weird food and all the Kool-Aid you could drink). Then there was the year we went to New Mexico, to the Philmont Scout Ranch and took a 50+ mile backpacking trip through theNew Mexican wilderness. It was AWESOME! Several days on a bus across an America I’d never seen before—the Mississippi River, the St. Louis Arch, Mt. Rushmore, Yellowstone, the Rockies and Cimarron, New Mexico. The scenery was gorgeous, the camaraderie was great, and the memories have lasted a lifetime. From that point on I was infatuated with the ‘West’ and I suppose I was destined to be out here. It stoked my love of nature at an early age, that wonderment at the cathedrals and epic landscapes that I saw. Later I’d become National Park Service Ranger in neighboring SE Utah. Also on that New Mexico trip I first ‘Cowboy’ music, the Sons of the pioneers ‘Blue Shadows on the Trail’ being played around a campfire under all those New Mexican stars. I’ve been a fan of that ‘Western’ brand of country and cowboys ever since. It wasn’t all epic trips and it was often work, but the best things in life often are worth working for and looking back now the work seems minimal. Hell, I think that Mom and Dad probably worked far harder at it than we did (so we’d stay with it), more than anything.